It was about 7 years ago that I first traveled to Colombia, in October 2003. Since then, I’ve taken part in the country’s everyday life for about 4 years in total. The following is an attempt to give a summarised but fair account of how life is lived over here in one of the most active cities of the country, Cali – the salsa capital of the world – and of the surrounding environment that sets the conditions in which life is developed. The article is divided into three parts with eight different headings that include the following topics: salsa dancing (1), work (2), local transportation (3), education (4), everyday violence (5), and poverty (6). Other important topics related to Colombian everyday life will be returned to in upcoming articles. In the statistics, Colombia is a poor country, and as such among the poorest in Latin America. Although one is constantly surrounded by street children and homeless people moving around in the background in most Colombian cities, poverty is not what strikes you. What struck me, once I had started to adapt to and integrate with the local environment, was the abundance of richness; the richness of the many flavors of culture, the richness of the strongly colorful nature, and the richness of the fantastic personalities of ordinary people. My first year in Colombia (2003-2004) actually passed by so wonderfully that I never really experienced first-hand anything of what the word poverty pictures. I was surrounded by so much happiness and richness as well as warm welcomes from southwestern to the northern coasts. I was shown around and met by so much positivity in different forms that the material poverty in the background never really got through to me. An important factor adding to my fully positive experience in Colombia is that I arrived when the economically prosperous years of 2003-2008 had just started. Optimism was spreading around the country as a strong priority on violence reduction that helped the economy grow at a high average of 5.5 percent of GDP per year. This had not been observed in a long time and even surpassed the achievements of Brazil, Chile and Mexico at the time. Unfortunately, while several Latin American countries managed to get a large share of their inhabitants out of poverty and misery through decent employments, Colombia’s flourishing investment confidence did not manage to benefit the poor much. Brazil got 40 million people out of poverty. Peru reduced its misery rate in half. Venezuela, despite its polarized politics, reduced its poverty and extreme poverty in half, and Ecuador decreased its poverty by 10 percent. At the same time, Colombia’s social improvements happened only one fraction at a time. The poverty rate was reduced by only 5 percentage points (from 51 to 46 percent) and among the poor, the number of extreme poor returned to almost the same rate as in 2002, on the border of a scandalously high 18 percent. This means that almost one in five Colombians still don’t have enough income to cover their basic hunger needs. (Source: www.semana.com, March 13, 2010 – For more background on the previous presidency, see the article Elections towards Legality or Security? from May 2010). So despite a growing optimism about the country’s future, poverty rates did not see much improvement. At first, I could only notice how poverty shadowed the surroundings by observing the beggars and street children in the backgrounds of where I moved around. I didn’t realize the depth of the problems. It was violence that I was told to stay away from, by not moving around in the dangerous areas or walk outside after nightfall, less so alone. I was told not to travel by bus between cities to avoid the risk of being kidnapped by the guerilla. However, in the end, and thanks to the tough politics against guerilla violence, I could in fact travel by bus between cities without any disturbances. On my third stay in Colombia, I started getting a deeper grasp of the country’s difficulties with poverty. This time, I actively sought the opportunity to learn more, by getting connected with individuals and organizations who lived and worked for the poorest of the country. 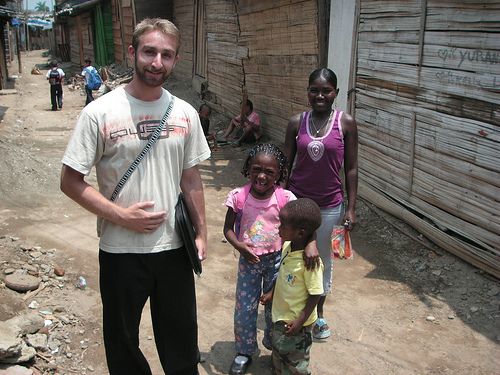 This was in 2007, when I started moving around in the poorest and most dangerous areas of the city. 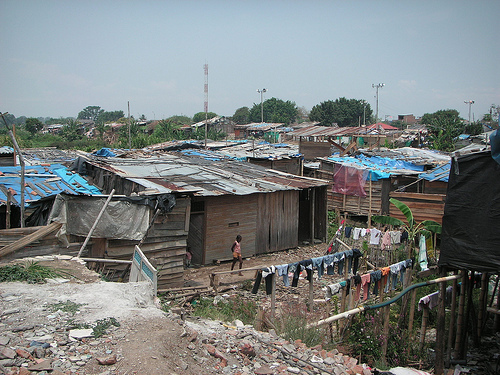 I got to see first-hand what it really meant to live in poverty in Colombia. The pictures are from one of the most recent invasions, called La Florida, in Aguablanca, the largest poor district of Cali. I got to familiarize with quite well with Aguablanca and its residents during my research on education for the poor. Here, the conditions are among the worst in the country. People live in hand built wooden shack houses, many of which are built upon poles for elevation to evade the flooding of the rain periods. These are results of the in-country immigration nightmare, which due to guerilla attacks and paramilitary activity has forced millions of Colombians to flee their homes on the countryside. The outskirts of the larger cities has become their rescue and what they are now forced to call their homes. One explanation is of course the eternal armed conflict of the country that according to a national survey has forced 760 000 farmer families to flee their homes to save their lives between 1998 and 2008, leaving behind 5.5 million hectares of land. Before this nightmare, half of these families were considered poor and a third had income levels at misery rates. The consequences have left 97 percent of these families in poverty and 80 percent in misery, a social catastrophe that continues until today. On a national level, poverty on the countryside is above 65 percent. (Source: Dane 2010). The other tremendous problem is corruption. Thousands of millions of pesos of public social spending money have been lost to scrupulous politicians or to armed actors, as was revealed in the para-politics scandal from 2006. According to Transparency International (which measures the perception of corruption of the public sector in 180 countries) Colombia has been worsening in the last years. In 2009, it went from position 70 to 75. If it was about the highest number of people with social services, in general, the Uribe government was successful; between 2002 and 2008, the number of places in education was increased, and in health care the leap was gigantic; from 50 percent of the population covered in 2002, to 89 percent today. Unfortunately, the coverage rate grew so fast that it put the system at risk. As to bring protection to the most marginalized, Colombia has followed the pattern of other Latin American governments; to give money to the people on certain conditions (that they assist medical controls, send their children to school, etc.). However, the richest are still left with 30 percent of the public social spending, the main reason being that those with the highest salaries receive 86 percent of the pensions and those with the least, only 0.1 percent. The consequence of the economic boom is an even wider gap between rich and poor in Colombia. Starting the 21st century, Colombia was in the category of countries in the world with high indices of inequality, together with Peru and Brazil, the latter being the most unequal country in Latin America at that time. By 2008, Peru had advanced to the middle category and Brazil had left the category of extreme inequality altogether. Colombia, however, had dropped down to the even lower category of very unequaled countries. (Source: ECLAC 2010). 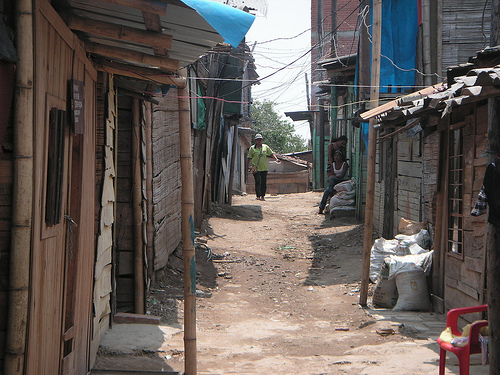 Poverty is a complicated issue in Colombia. Attempts of fighting it from different perspectives will be elaborated on in more depth in upcoming articles. Better investments in quality education for the poor as well as facilitation of entrepreneurial growth are examples on which I will continue to focus my personal attention. On a more general level, I will also try to give an updated account on the sitting government’s efforts and achievements in reducing the poverty rate and providing more Colombians with better opportunities. This will be presented in an upcoming article series following up on the presidency of Juan Manuel Santos. Note: There are different definitions of poverty that affect the precise statistics to some extent. However, the numbers presented in the article are in line with the overall statistics found by the author.